This major exhibition runs from 19 March to 31 October 2010. 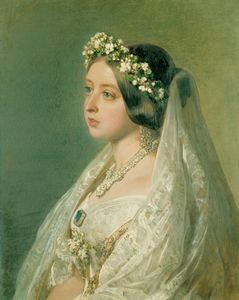 The exhibition focusses on the unique partnership of Queen Victoria and Prince Albert and their shared enthusiasm for art from the time of their engagement in 1839 to the Prince’s early death in 1861. For Victoria and Albert, art was an important part of everyday life and a way they expressed their love for each other. Around a third of the objects in the exhibition were exchanged as gifts between the couple to mark special occasions. They range from the simple, romantic and sentimental jewelry to superb jewels and other great art, such as an early Italian painting, including Bernardo Daddi’s The Marriage of the Virgin, given by the Queen to the Prince for his birthday in 1846. 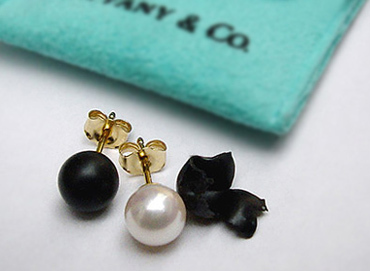 This is the fitted box and the original blossom brooch. This gold and porcelain blossom was one of the first gifts Prince Albert gave his fiancee. The box is inscribed “Sent to me by dear Albert from Wiesbaden Novr. 1839”. 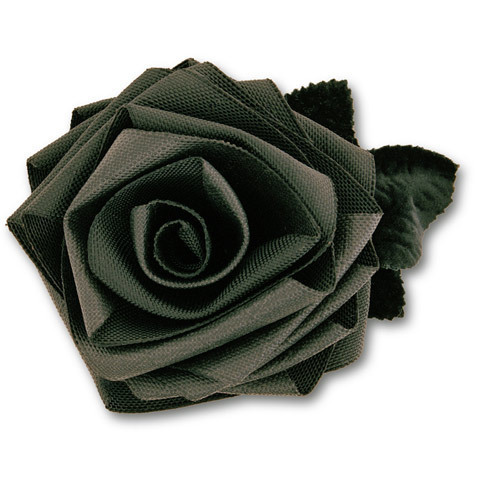 It has the form of a sprig of orange blossom which flower is traditionally associated with engagement. At the wedding the Queen wore sprays of real orange blossom in her hair and on her bodice. 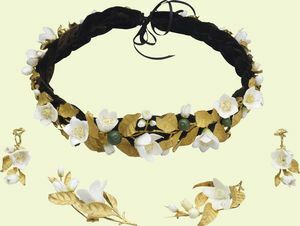 The Prince continued to give Victoria orange blossom jewelry, eventually creating a beautiful parure, parts of which she always wore on their wedding anniversary. 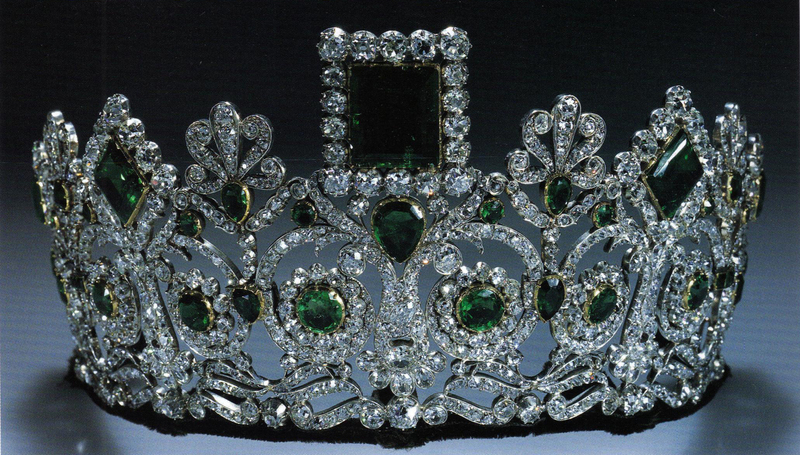 The Koh-i-nûr diamond, the most famous gem from the Lahore Treasury, came directly to Queen Victoria from India in 1850, other significant jewels remained with the East India Company for the Great Exhibition. In recognition of the Queen’s patronage of the Exhibition, the Directors of the Company presented her with a magnificent selection of stones, of which the ‘wonderful’ rubies ‘cabochons, unset, but pierced’ particularly struck her: ‘one is the largest in the world, therefore even more remarkable than the Koh-i-noor’. 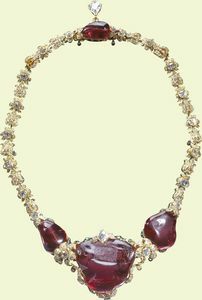 This, the so-called Timur Ruby, which weighs 352.5 carats, together with three smaller stones – all of which are actually spinels rather than rubies – were set by Garrards into a new necklace of Oriental inspiration in April 1853. 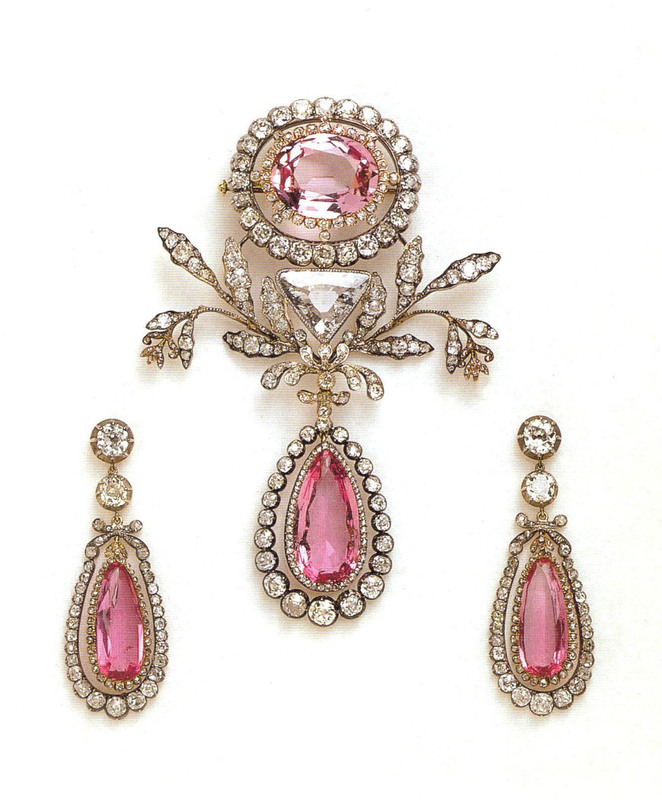 In June of the same year the necklace was adapted so that the re-cut Koh-i-nûr could occasionally take the place of the Timur Ruby; and in 1858 three of the five pendant diamonds originally attached to the centre of the necklace were made detachable for alternative use, two as earrings and the central pendant (the Lahore Diamond) as the centre of the Coronation Necklace. The history of the stone, with its illustrious provenance from the Mughal Emperors Jahangir, Shah Jahan, Aurangzeb and Farrukhsiyar, and the Persian rulers Nadir Shah and Ahmad Shah, is partly recorded in inscriptions dating between 1612 and 1771 on the stone itself. The connection with the great Asian conqueror Timur (1336-1408), which arose from a misreading in the early twentieth century of one of the inscriptions, has recently been reconsidered, and it is now thought possible that Nadir Shah, who looted the stone from the imperial treasury in Delhi in February 1739, may have placed his inscription over an erased inscription proclaiming Timur’s ownership. On 19 June 2010 Crown Princess Victoria of Sweden has married her former fitness trainer, Daniel Westling. 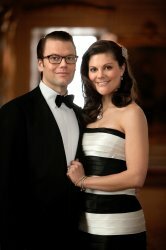 He will be HRH Prince Daniel, Duke of Västergötland from now on. It was a lovely and extravagant ceremony. What a feast to see this marriage. I had no difficulty choosing between the soccer game and Victoria! Victoria wore a cream-colored gown with short sleeves and an endless train designed by Pär Engsheden that looked like marzipan. 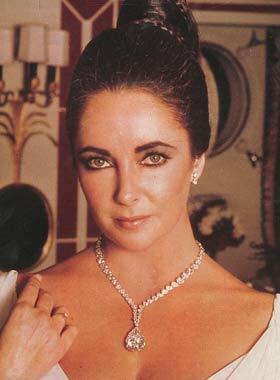 And just like her mother Silvia at her wedding in 1976, she wore the Cameo tiara, made of gold, pearls and 7 large hard stone cameos depicting mythological figures. In the centre there’s the crowning of love (mother and child), flanked by portrait-cameos of a man and a woman aim their sight. On the backside portrait-cameo’s are interchanged with a godess who has a putti on her lap (caretaker) and a man with a staff (guard). 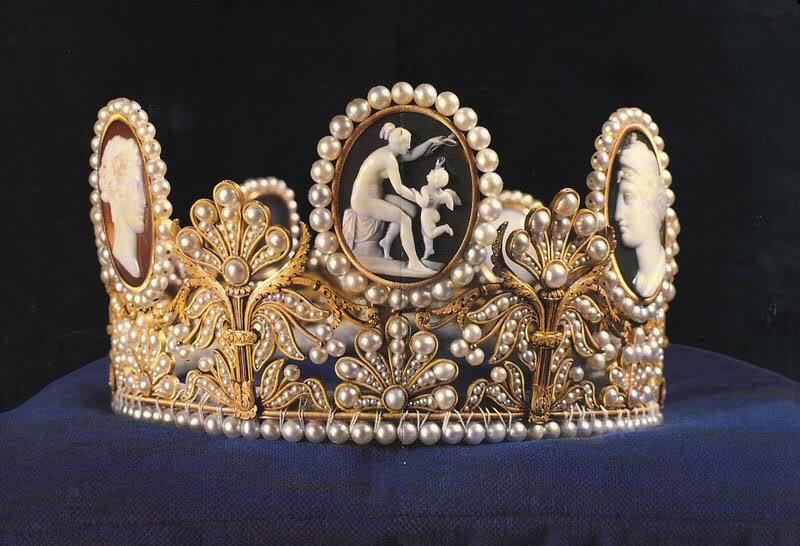 Amongst other jewels, this Empire cameo tiara which is part of a parure was brought into the family by Queen Josefine princess of Leuchtenberg when she married Crown Prince Oscar (the future King Oscar I) in 1823. Josefine was the granddaughter of Empress Josephine. The parure was made for Josephine around 1809 by Marie-Etienne Nitot, who was Napoleon’s jeweller and founder of the jewellery house Chaumet. 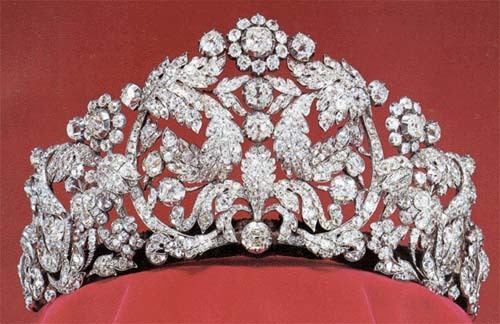 With the next generation of the Bernadottes, the tiara was owned by Queen Josefina’s daughter Princess Eugénie, who in turn left the tiara to her nephew Prince Eugen. The prince gave the tiara to Princess Sibylla on her marriage to Prince Gustaf Adolf in 1932. The King was left the tiara by his mother.The King’s sister, Princess Birgitta, started the tradition when she chose Queen Josefina’s cameo tiara as her bridal crown for her wedding with Prince Johann Georg of Hohenzollern in 1961. Princess Désirée also wore it in 1964 and so did Queen Silvia in 1976. Read more on the King’s sisters jewels at Victoria’s wedding here. Queen Sonja of Norway wore a coral-colored dress along with the Empress Josephine of France emerald and diamond tiara that also came into the family through Queen Josefine of Sweden. Queen Silvia of Sweden wore a bright pink dress to match the stunning Empire parure of Grand Duchess Maria Pavlovna. 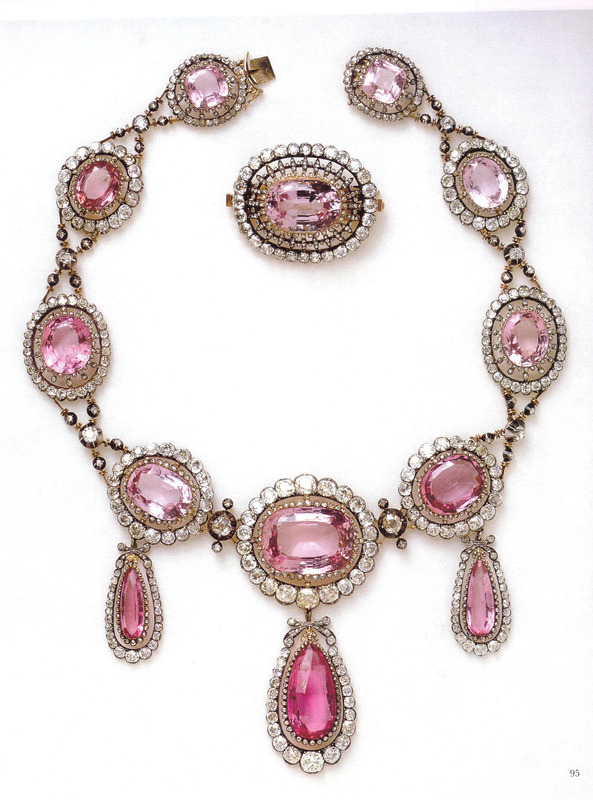 All diamonds and Brazilian pink topazes made around 1804. 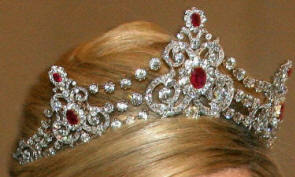 Also she wore the diamond Braganca tiara. This is the biggest tiara of the Swedish royal family which once belonged to Empress Amalie of Brazil the sister of Queen Josefine of Sweden. Our Princess Maxima wore beautiful simple diamond rivière necklace and a diamond bandeau. Possibly the rivière necklace that the Dutch people gave Queen Emma as a wedding present in 1879. Queen Beatrix wore the Mellerio ruby and diamond tiara which was a gift from King Willem III to his second wife, Queen Emma in 1889. 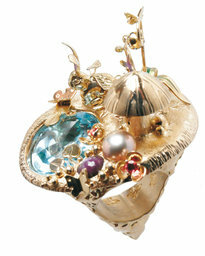 It is part of a parure by Jeweler Mellerio dits Meller from Paris. It is the most complete parure in the Orange-Nassau collection. It consists of 7 jewels. Queen Juliana was very fond of this parure and has worn it often, so does Maxima today. This painting by Werner van den Valckert is on display at the Rijksmuseum in Amsterdam. 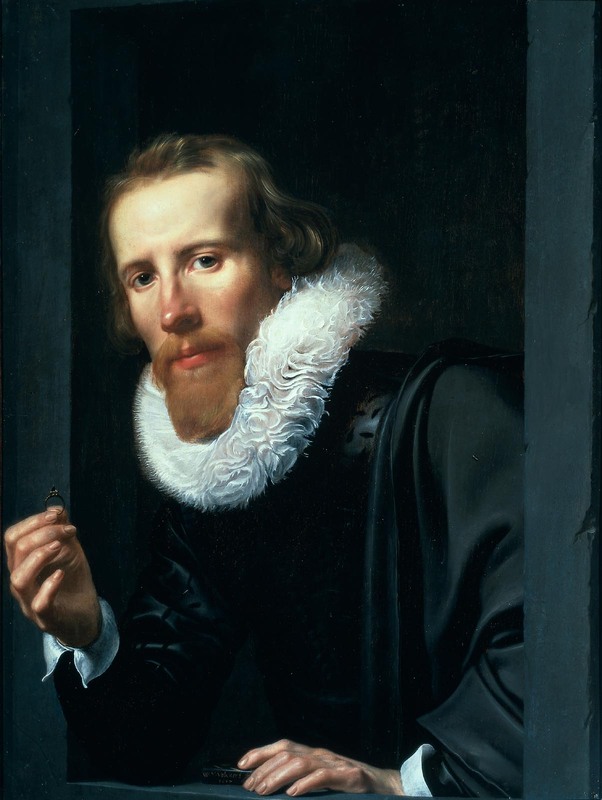 It shows a portrait of Bartholomeus Jansz van Assendelft (Leiden, 1586-1659). He is leaning out of a window, in his right hand he holds a ring with a large octahedron and in his left hand he holds a touchstone. 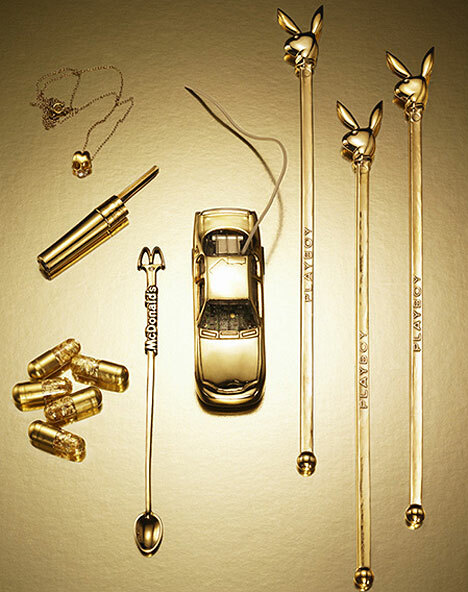 Both objects are clues that point to his profession as a goldsmith. Van Assendelft’s left hand is brightly lit, which draws your attention to the touchstone, which also shows off his honorable function as judge of his guild. And on the touchstone the painter signed his work: We read W v Valckert fe 1617. Van den Valckert was a mysterious person in history and his name is not found in the registers after 1627. He became a member of the painters Guild of St. Luke in the Hague between 1600-1605. From this we can assume that he was born around 1580-1585. We can conclude that by 1614 he had moved to Amsterdam, because his daughter was baptized there. His earliest dated prints are from 1612. His surviving paintings are historical allegories and portraits. Van den Valckert also made a prestigious schutterstuk, which features the Amsterdam major Albert Burgh. According to his biographer Arnold Houbraken, Van den Valckert was a student of Hendrik Goltzius. A touchstone is a small tablet of dark siliceous stone (such as fieldstone, slate, or lydite) used for assaying precious metal alloys. 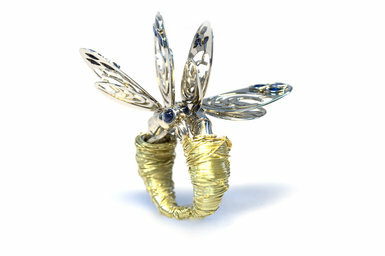 It has a finely grained surface on which soft metals like gold, leave a visible trace. Assaying by touch was one of the earliest methods used to measure gold alloys. You draw a line with gold of your jewel on the stone. This can leave a scratch on the jewel if you have to remove any upper gilt layers. Alongside the drawing you make another scratch of known gold samples. Then the traces of gold are treated with acids that dissolve impurities. The trace will react differently to specific concentrations of nitric acid applied, and by this you measure the gold content of the jewel. The color of the reacted area is compared to that of the reference sample. 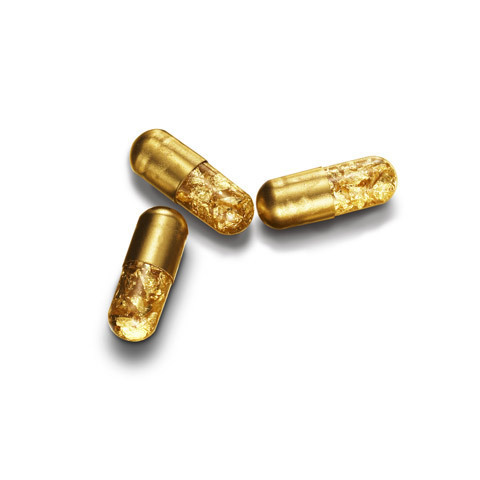 A 14 carat (or any lower carat) gold jewel will show chemical activity and dissolve when tested with 18 carat gold acid, but when the trace is not affected it can be identified as 18 Carat gold (this means 750/1000 gold and 250/1000 other materials; copper, nickel, zinc). A complicated detailed operation to achieve a beautiful result! An octahedron is one of the diamond’s natural crystal shapes. 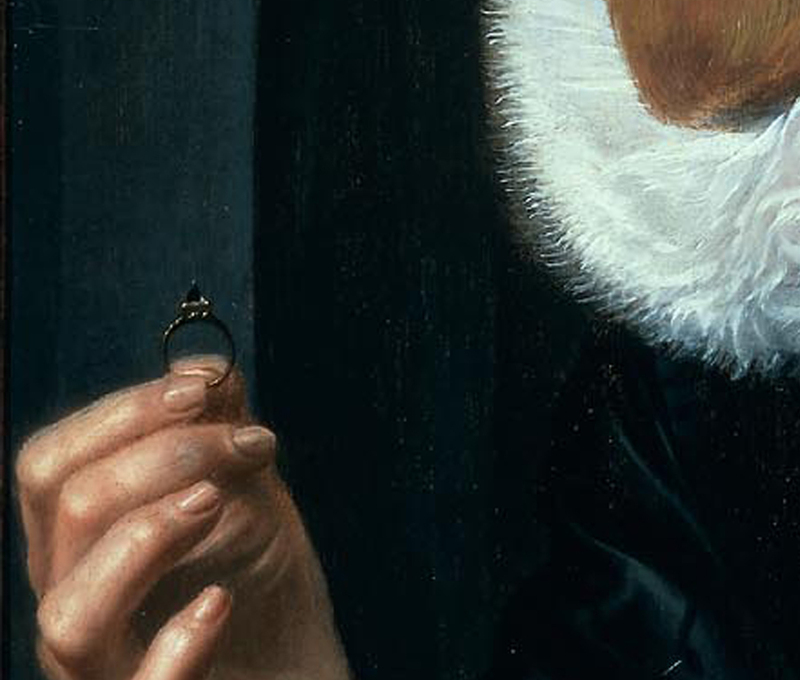 And the ring that Van Assendelft is holding clearly contains an octahedron cut stone. We see a piece of glass or a rock crystal, but most likely a diamond. Diamonds crystallize as octahedrons, cubes, or dodecahedrons. Try to scrabble that! It sometimes shows habits that contain two or more of these forms. But the octahedron is one of the rarest forms. 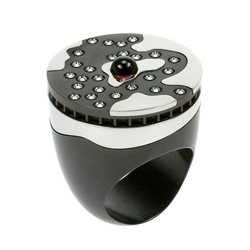 The word diamond originates from adamas which means invincible in Greek. The first adamas came from India and were hardly cut. Because of their beauty and strength, they were worshiped as talismans, and cutting a diamond would not benefit its strength. 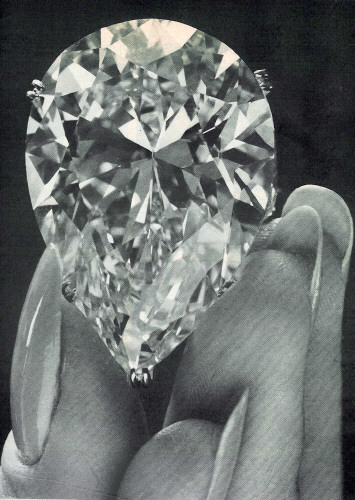 The Europeans changed this point of view, in order to bring out the fire and brilliance of diamonds. 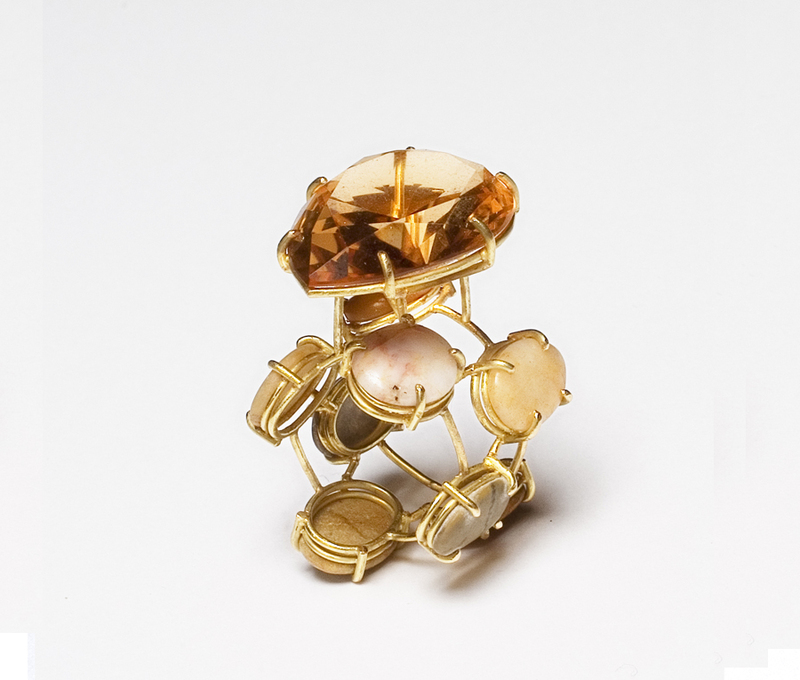 Symmetrical octahedrons, very rare rough crystals, were the first to be polished or cut – in a pyramidal diamond like the one in van Assendelft’s ring. 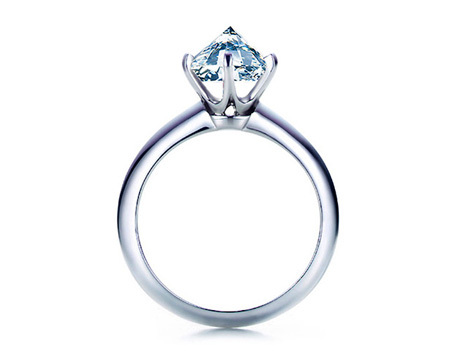 One pyramid is completely hidden in the shank of the ring, the top part is shown. Quite fantastic to look at and even more to carry! 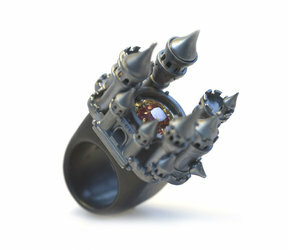 I also love this 16th century Moghul ring with a cinnamon octahedron diamond that we sold a few years ago. 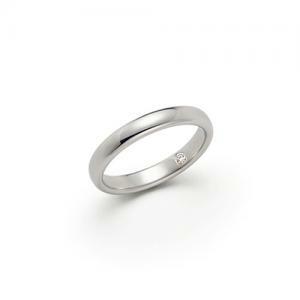 the Taylor-Burton, diamond or not? This fantastic bas-relief by Ron van der Ende is a 1.5 meter broad wooden copy of the Taylor-Burton diamond. 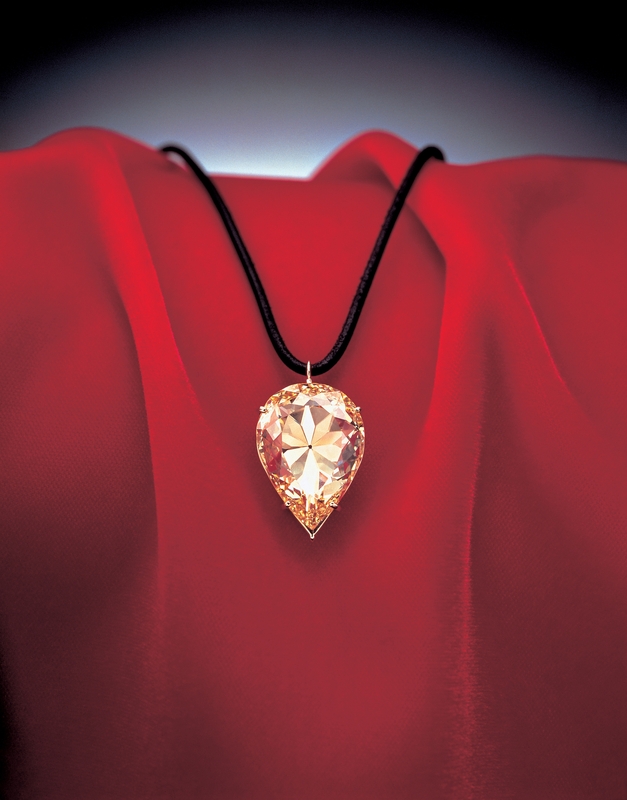 Richard Burton gave this pear cut diamond of 69.42 carat to Elisabeth Taylor in 1969. Which stone do you prefer? The diamond or the relief mosaic of wood, nails and glue?